Vaccinations in Oakland Park are an essential part of pet wellness care. Many pet owners have questions about what vaccinations are right for their pet or how frequently a pet needs to be vaccinated. Below, our Oakland Park veterinarian answers five of your top Oakland Park Vaccinations FAQs. #1: How do pet vaccines work? Oakland Park vaccinations protect pets against deadly diseases, helping your pet to live a long, healthy life. Vaccinations prepare your pet’s immune system to fight disease-causing organisms. Vaccines contain antigens, which resemble a disease-causing organism without actually being able to cause a disease. When a vaccine is introduced into a pet’s body, the antigen alerts the immune system to recognize future disease-causing organisms. This helps your pet’s body fight off the disease from the first sign of infection, preventing or seriously reducing the risk for illness. 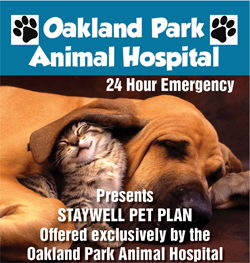 #2: Which Oakland Park vaccinations should my pet receive? 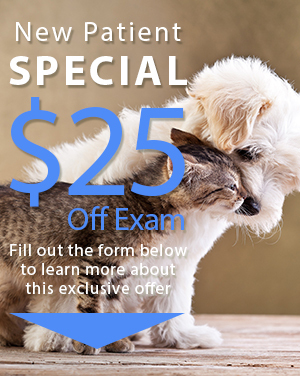 Our veterinarian recommends that all pets receive core vaccination shots. In 2006, the American Animal Hospital Association (AAHA) passed guidelines mandating specific vaccines as core, non-core, and not recommended. Core vaccines are those that are considered vital to a pet’s health based on the side effects or the severity of the disease should exposure occur. Core dog vaccines are canine parvovirus, canine hepatitis, distemper, and rabies. For cats, core vaccines are panleukopenia (feline distemper), feline calici virus, feline herpes virus type I (rhinotracheitis), and rabies. #3: How often should my pet be vaccinated? Pets should be vaccinated in accordance with the vaccine manufacturer’s guidelines and our assessment for your pet’s risk of exposure. Following the initial round of the puppy/kitten vaccination series, pets will need a booster shot approximately one year later. After this booster shot, most pets will receive subsequent core vaccination booster shots every three years. Some non-core vaccines, like bordetella, will require a booster shot every one year. Our veterinarian works closely with pet owners to ensure all pets are up to date on their core vaccinations. #4: Are there any risks to vaccinations in Oakland Park? Like any medication, there is a small risk for an allergic reaction with pet vaccinations. The symptoms of allergic reaction to pet vaccinations include swelling at the injection site, sluggishness, fever, loss of appetite, lameness, diarrhea, and vomiting. If your pet has safely received vaccinations in the past without any allergic reaction, it is highly unlike that a future reaction will occur. In general, vaccine reactions are minor and do not significantly affect a pet’s health. If you think that your pet is having a reaction to a vaccine, contact our veterinarian immediately. #5: When should my puppy or kitten first be vaccinated? Our veterinarian recommends vaccinating puppies and kittens shortly after they are weaned. The puppy/kitten shot series is typically administered starting at 8-10 weeks. Subsequent Oakland Park vaccinations are given every three to four weeks until a puppy or kitten reaches 18-20 weeks of age, when the immune system matures.